Homelessness in popular culture is depicted in various works. The issue is frequently described as an invisible problem, despite its prevalence. Writers and other artists play a role in bringing the issue to public attention. 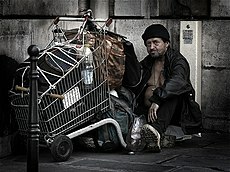 Homelessness is the central theme of many works; in other works homelessness is secondary, added to advance the story or contribute to dramatic effect. 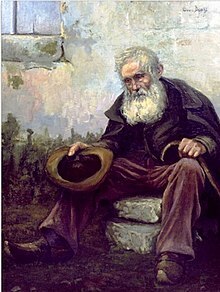 Homelessness is the central subject in most of the works of art listed here. The homeless are frequently divided as either protagonists or antagonists. Characters, like Chaplin's Little Tramp, provide light-hearted humor through lovable personalities. Fred Glass writes the social type of Chaplin's character represented was familiar and emotionally appealing. One account given is that Chaplin based his character on a man whom he had met in San Francisco in 1914. Other popular culture depicts the homeless as mentally ill, or even psychotic. 1800s "Hallelujah, I'm a Bum" - traditional folk song. 1908 "If It's Good Enough for Washington It's Good Enough For Me", music by Percy Wenrich, words by Ren Shields - sleeping on bench in public square with statue of George Washington. 1915 "Those Charlie Chaplin feet" by Edgar Leslie and Archie Gottler. 1929 "The Right Kind of Man" by L. Wolfe Gilbert and Abel Baer. 1930 "Brother, Can You Spare a Dime? by Jay Gorney and Yip Harburg. 1930 "Singing a Vagabond Song" by Harry Richman, Val Burton and Sam Messenheimer. 1962 "Man on the Street", by Bob Dylan, officially released on 1991's Bob Dylan: The Bootleg Series. 1963 "Only a Hobo", by Bob Dylan, officially released on 1991's Bob Dylan: The Bootleg Series. 1965 "King of the Road (song)" from the album, The Return of Roger Miller." 1968 "I Am a Lonesome Hobo", by Bob Dylan, from his 8th studio recording John Wesley Harding. A humble warning from a homeless man to those who are better off. 1969 "Highway Chile", by Jimi Hendrix Experience. The song is about a homeless man that Jimi met when he was on tour. 1987 "Day-In Day-Out" by David Bowie. The song was written about the treatment of the homeless in the US, and the video, which was shot in Los Angeles, was nominated for a 1987 MTV Video Music award in the category of "Best Male Video". 1989 "Another Day in Paradise" by Phil Collins, a controversial but nevertheless Brit and Grammy award-winning song which was included on his album ...But Seriously. It became the last Billboard Hot 100 number-one single of the 1980s. 1991 "Even Flow", music by Pearl Jam, lyrics written by Eddie Vedder telling a story about a homeless man. 1991 "Homeless (Like the Christ Child Was)" on the album "The Forgotten Carols" by Michael McLean. 1993 "Shelter" by Duran Duran. 1993 "Somebody's Baby" by Pat Benatar. 1996 "Low Man's Lyric" by Metallica. 1998 "What it's like" by Everlast. 2000 "If That Were Me" by Melanie C, a top 20 UK hit single from her debut solo album Northern Star. 2004 "Nobody's Home" by Avril Lavigne. 2007 "There Is No Good Reason" by Natalie Merchant on the compilation album, Give US Your Poor. The song was written by a 15-year-old homeless girl, Nichole, telling about her ordeals and struggles. 2007. Give US Your Poor. It has 17 recordings to help end homelessness with artists such as Jon Bon Jovi, Natalie Merchant, Pete Seeger, Bruce Springsteen, Sonya Kitchell, Bonnie Raitt, and actors Danny Glover and Tim Robbins. 1948 Easter Parade (film) features a short, but famous depiction of vagrants. 1966. Cathy Come Home—an influential film by Ken Loach which raised the profile of homelessness in the UK and led indirectly to the formation of several charities and changes in legislation. 1977. Simple Gifts on IMDb —opening original segment by Maurice Sendak in collection of six animated Christmas shorts, PBS TV special issued on VHS in 1993. 1985. Tampopo—featured a scene where a community of culinary bums live quite well and one of them becomes instrumental to the narrative. The scene as has been reference in other works. 1987. Morning Patrol -- Nikos Nikolaidis. 1987. Ironweed—based on the 1983 novel Ironweed by William Kennedy which won the 1984 Pulitzer Prize for Fiction. 1989. No Place Like Home on IMDb —made-for-TV film depicts a family's descent into homelessness. Christine Lahti won a Golden Globe for her performance as the mother. 2003 Monster — Biopic of serial killer, Aileen Wuornos. 2006. Lights in the Dusk -- Aki Kaurismäki. 2008. Hancock—a homeless, down and out superhero spoof. 2009. The Soloist—based on a true story of Nathaniel Ayers, a musician who becomes schizophrenic and homeless. 1978. The Agony of Jimmy Quinlan is a National Film Board documentary about homeless alcoholics in Montreal (video online in full). 1984. Streetwise—follows homeless Seattle youth. 1993. It Was a Wonderful Life on IMDb —chronicles the lives of six articulate, educated, "hidden homeless" women as they struggle from day to day. Narrated by Jodie Foster. 2000. Dark Days—A film following the lives of homeless adults living in the Amtrak tunnels in New York. 2001. Children Underground—Following the lives of homeless children in Bucharest, Romania. 2003. À Margem da Imagem on IMDb —about the homeless in São Paulo, Brazil. Its English title is "On the Fringes of São Paulo: Homeless". 2005. The Children of Leningradsky—About homeless children in Moscow. 2005. Reversal of Fortune—A homeless person is given $100,000 and is free to do whatever he wishes with the money. 2006. Homeless—About Homeless people and homelessness in England. 2007. Easy Street—about the homeless in St. Petersburg, Florida. 2008. The Oasis—an observational documentary about homeless youths in Sydney, Australia, filmed over two years. 2008. The Ballad of Robert and Harvey: We Are Not Faraway on IMDb - "Centered on the troubled friendship between Robert and Harvey, the film exposes the unique hardships and common humanity of people who live among us but are virtually unknown." 1977. Underneath the Arches, a ground-breaking documentary produced by Owen Spencer-Thomas on BBC Radio London in which London's homeless people were enabled to tell their own stories. 1988. Home Sweet Homeless on IMDb —a CBS Schoolbreak Special about a mother and her son who find themselves having to live in their car. 1951 - 1971. The Red Skelton Show features Freddie the Freeloader, played by Red Skelton. 1951. An episode entitled "The Quiz Show" of I Love Lucy features Lucy (played by Lucille Ball), who in order to win $1,000 has to trick her husband, Ricky (played by Desi Arnaz), that she has a long lost previous husband. Harold the Tramp (played by John Emery) is mistaken by Lucy for the actor hired by the game show producers. 1961. An episode entitled "Opie's Hobo Friend" of the second season of The Andy Griffith Show deals with Opie's (played by Ron Howard) friendship with an immoral homeless individual, David Browne (played by Buddy Ebsen). 1963. An episode entitled "Beaver's Good Deed" of the sixth season of "Leave it to Beaver" features Beaver (played by Jerry Mathers) who befriends and cares for a homeless individual, Jeff (played by Frank Ferguson), while his parents are away. 1972. An episode entitled "The Show Must Go On??" of the fourth season of The Brady Bunch features the mom, Carol (Florence Henderson), and her daughter, Marcia (Maureen McCormick), play two homeless individuals, as they sing " Together (Wherever We Go)." 1977. "The Easter Bunny Is Comin' to Town" features Hallelujah Jones who is a lovable tramp who befriends Sunny and suggests that he sell his eggs in a town called Town. 1987. "Brother, Can You Spare A Dime", of the sitcom, Kate & Allie, Allie gets stranded in the north end of Manhattan and has to make it back to Greenwich Village with no money. At one point, Allie asks herself where homeless people go to the bathroom. The episode ends with a special tribute to the homeless. 1991. "The Library" of the sitcom, Seinfeld, surrounds itself on George's former teacher, Mr. Heyman, whom he learns became homeless. 2007. "Night of the Living Homeless" was an episode that appeared on Comedy Central's South Park. It was first broadcast on April 18, 2007. 1902. The Lower Depths, a play by Maxim Gorky, inspired by the residents of a Nizhny Novgorod homeless shelter. 1985. Stinkfoot, a Comic Opera - a musical which includes the homeless Mrs. Bag Bag. 1905. "The Cop and the Anthem" (short story) by O. Henry. 1993. Stone Cold by Robert Swindells. 1996. Junk by Melvin Burgess. 1907. Tramping with Tramps by Josiah Flynt. 1933. Down and Out in Paris and London by George Orwell. 1998. The homeless in Paris: a representative sample survey of users of services for the homeless, in Dragana Avramov, ed, Coping with homelessness : issues to be tackled and best practices in Europe, Ashgate Publishing, by Maryse Marpsat and Jean-Marie Firdion. 2005. Without a Net: Middle Class and Homeless (With Kids) in America by Michelle Kennedy. 2005. Under the Overpass: A Journey of Faith on the Streets of America by Mike Yankoski. 1568. "The Beggars" by Pieter Bruegel the Elder. 17th-Century. Woodcarved beggars by various Italian woodcarvers. 2005. Photographic expose by Michel Mersereau entitled "Between The Cracks"
^ "HUMAN RIGHTS: More Than 100 Million Homeless Worldwide" Archived 2009-04-22 at the Wayback Machine. ^ Glass, Fred (2016). From Mission to Microchip: A History of the California Labor Movement. Berkeley: University of California Press. ^ Pegg, Nicholas (October 2016). "The Complete David Bowie New Edition: Expanded and Updated". Titan Books. ^ "MTV Video Music Awards 1987". 11 September 1987. Retrieved 28 October 2013. ^ "A Walking Tour of... Kurt Cobain's Aberdeen". The Aberdeen Museum of History. Retrieved 2008-12-08. Whether Cobain ever slept under this bridge as he claimed is not certain, however, he did spend time beneath the south approach, as did many of the neighborhood kids. ^ Bienias, Michelle (January 2005). "Kurt Cobain's 'Bridge' in Aberdeen, Washington" (18). VR MAG. Archived from the original on 2008-10-06. Kurt lived under this bridge for a time when he was 15 and frequented it as a ‘hang out’ of sorts as well. His experiences living under this bridge were the basis for the Nirvana song ‘Something's In the Way’. ^ Give US Your Poor organisation: The Campaign to End Homelessness - University of Massachusetts, Boston. ^ Give US Your Poor - multi-artist album at Appleseed Records. ^ Flynt, Josiah (1907). Tramping with Tramps. New York City: The Century Company.